This is another warning for Filipinos since the Philippines is a country frond of using internet and making transactions online. The warning goes to those who are receiving emails regarding selling of products and shipping them but the transactions are done through email. This is how it goes: most of the victims of the so-called love scam are women who fell into the trap of those who are offering products and the senders came mostly from Australia, United States and United Kingdom. Once the email is sent and someone read it and follows the instruction given by the sender, that will be the time when victimizing happens. An email message from the Bureau of Customs (BOC) will be received by the receiver of the message prompting her to settle her accounts by paying amounts. She will then deposit a certain amount required on an account but after that there will be no merchandise that will arrive. 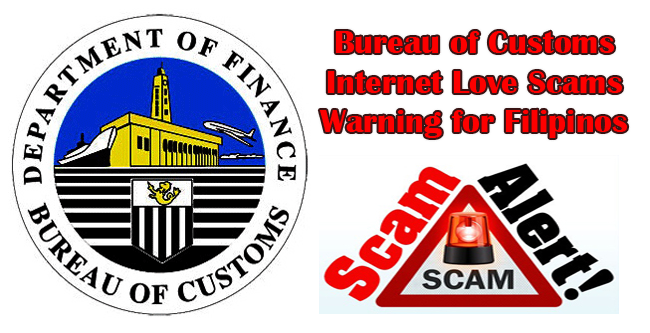 The Bureau of Customs (BOC) clarified that they do not settle accounts through emails that the public should be aware of this so that they will not become the next victims of these scammers. The thing is the BOC gave contact information so that those who are going to receive this kind of message will be able to address first the issue to the BOC to verify if they are really asking such amount of money for the settlement of the shipment of the products. Those are the contact details of the BOC for the protection of all. Recently, a suspect for internet scamming was nabbed through an entrapment operation with the AFP and ISAFP. The name of the alleged suspect is Herminia Castillo. He was arrested in Mabalacat, Pampanga last Thursday morning.